At La Mitad Del Mundo, a tourist attraction outside of Quito, Ecuador, visitors are invited to watch a demonstration after they've finished taking corny photos of themselves straddling the line dividing the world. Three tubs stand on both sides and on the middle of this line. The demonstration begins, as pink-nosed travelers clutch their Tilly hats in anticipation. One tub drains clockwise, the other swirls counter-clockwise. The tub on the line drains straight down, as the demonstration leader praises the equator's majesty. It's the kind of exhibit designed to make you feel like the Earth is marvelous, mysterious, and weird. Which, of course, it is. But the demonstration is bogus. For starters, it's not located on the true equator, which is 240 kilometers away. And even if it did sit directly on the mid-line of the planet, the demonstration is to science what Keeping Up With the Kardashians is to documentaries. Your chances of seeing the phenomenon happen for real are about the same as our chances of seeing Scott Disick touch a poor person. It's an oddly durable falsehood. Textbooks and BBC documentaries have spread this bad information, as meteorology professor Alistair Fraser pointed out in a takedown of the myth; even the Simpsons writers have cracked jokes based on the idea that this happens. 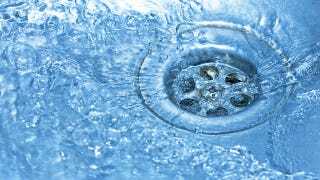 In reality, the water spiraling down our bathroom drains is subject to the same forces compelling its direction whether you're in Australia, Austria, or Austin, Texas. Why is this faux natural marvel so enduring? There is a scientific concept that explains how the Earth's eastward rotation affects the way we perceive very large moving objects as they travel. It's called the Coriolis effect. It can impact how hurricanes travel, but not the direction your spit sluices down a drainpipe. People perpetuating this myth often use the Coriolis effect as proof, but that's nearly as preposterous as saying there's going to be more snow on the leeward side of a puddle of dog pee because of the Lake effect. "For atmospheric parcels or ocean currents, [Coriolis] is a big player...for tubs or toilets, the scale is so small that other factors override Coriolis, i.e. forcing of the water into the toilet or tub and the physical set up of the drain and bath or toilet structure," Atmospheric scientist Jeff Weber, who works with the University Corporation for Atmospheric Research, told Gizmodo. "If you could completely eliminate all other forces (friction, water going in, shape of basin) there is a slight chance you could see Coriolis on that scale...it would need to be VERY carefully set up experiment and administered carefully." Unless rendered in an immaculate, lucky vacuum, videos and demonstrations showing that the water drains in different directions are the result of trickery. The drains at La Mitad Del Mundo likely swirl in their dramatically different way because of the way they're constructed, though I have not directly interrogated the Ecuadorian flimflammers behind this scheme. Maybe they did something else to achieve the contrivance, but the conditions at the exhibit are nowhere near pristine enough to allow for Coriolis to work on such small bodies of water. The world is full of actually remarkable phenomena, and it's frustrating to see people peddling sham science as a natural wonder. Next time you're in a different hemisphere, there's no point in spending time staring down a foreign toilet hoping it will drain differently.